Papua New Guinea (PNG) is endowed with abundant natural resources but development has been hampered by rugged terrain and high cost of developing infrastructure. In 2010, 8.6 million barrels of oil were exported; for 2011, the projected figure is 6.7 million barrels. Mineral Resources Development Company Limited is a 100% state owned company. Its responsibilities are managing the interests of provincial governments and landowners in petroleum and mining projects as well as promoting the country as an investment destination for resources projects. In 2003, the Department of Petroleum and Energy introduced new incentive rates to encourage exploration activity in the face of declining production from old fields. Oil fields are experiencing natural production decline while gas production has started to increase over the last few years. 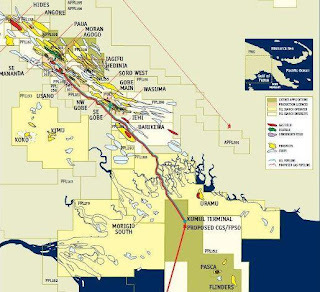 To counter the decline in oil production, more than 50 Petroleum Prospecting Licenses (PPLs) have been issued, blanketing almost the entire onshore and offshore Papuan Basin and most of the North New Guinea Basin. Oil Search has acquired farm-in rights in 4 new exploration licenses namely PPL 276, PPL 338, PPL 339 and PPL 312. Apart from that, there are currently 6 Petroleum Development Licenses (PDL), 11 Petroleum Retention Licenses (PRL) and 26 Applications for Prospecting Licenses (APPL). SEGobe oil production started in 1998 to feed into a designed production capacity of 50,000bbls/d. Unfortunately, it had been affected by production of sand. The fields are expected to reach their economic limit and ready for field abandonment before the first shipment of LNG cargo in 2013, while Kutubu and Moran fields will continue to produce oil. The Moran reservoir is different to Kutubu or Gobe fields in term of the type of oil deposit and its stored natural energy for oil production. Like other oil fields, Moran’s oil production has started to decline and currently produces at a maximum rate of 400bbl/d. Continued oil production is dependent on gas injection because the wells cannot produce on their own as they need the energy support from gas injection. Technically, this field is on life support by gas injection even though it has the largest remaining oil reserves. The NWMoran oil field is economically very marginal and initially contained far less than 1% of the total Moran Field oil. Most of the oil has been produced and there is not much oil left for continued production. Gas production in Hides started in 1991 with the development of the Hides Gas to Electric Project (GTE). It consists of a pipeline connecting the Hides-1 and Hides-2 wells to a small gas conditioning plant at the Hides Production Facility (HPF) located in the Tagari River valley. In 2010, production was 6,633mmscf. In 2010, the massive PDL-7 Hides PNG-LNG project in Hides kicked off with project financing secured and sales agreements finalized with major LNG customers in Japan, China and Taiwan. The project infrastructure extends over 4 provinces and first deliveries are projected at 2014. The gas will be treated at a gas conditioning plant at Hides before being transported via the Juha pipeline to a 6.6 million tons per annum LNG liquefaction and storage facility to be located 20km north-west of Port Moresby. 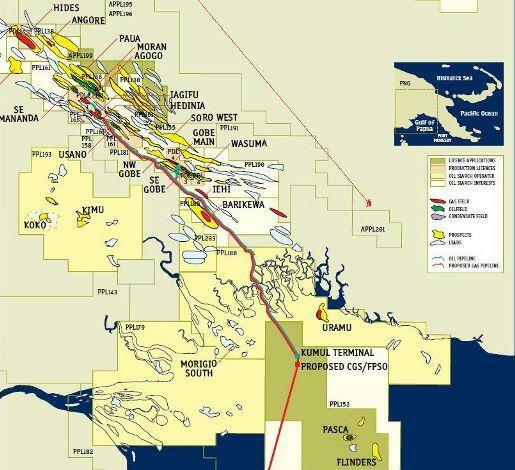 Over a 30 years period, the project is expected to produce some 9 trillion cubic feet of gas and an estimated US$32 Billion in direct revenue to the PNG Government and landowners. Several recent success stories show that the oil and gas sector in PNG still show great promise. In February 2009, the Stanley (under Petroleum License 4) field development plan was finalized with the PNG Department of Petroleum and Energy (DPE). The proposed project entails the production of 140 million cubic feet of gas per day from 2 wells, extraction of initially over 4,000 barrels of condensate per day and potentially 40 tonnes of LPG per day, with re-injection of the dry gas until a gas market develops. The operator of Petroleum License 4 is Horizon Oil (Papua) Limited. 2)Seismic acquisition programs or both PNG Highlands and the offshore region.